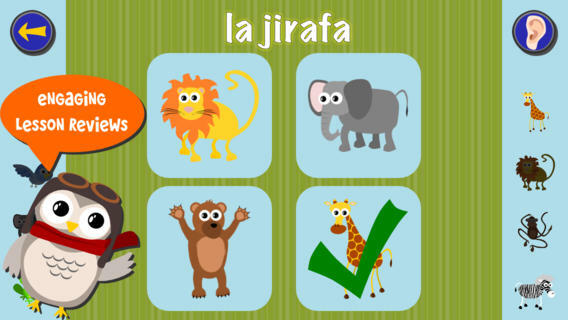 Gus on the Go: Spanish for Kids, developed by too juice, is an excellent learning tool to teach basic Spanish vocabulary concepts with interactive visual and auditory lessons on numbers, colors, shapes and more. When you first launch the application you will be presented with a map to follow where you will learn a bunch of spanish words. Simply touch on the object and the narrator will show you how to spell it and correctly pronounce it. Once you have gone through all of them you will then be quizzed. The narrator will say the word and you will see it on the screen. You then have to chose the correct answer out of the 4 pictures you see. If you match it correctly you will hear a dinging bell and get a check mark. 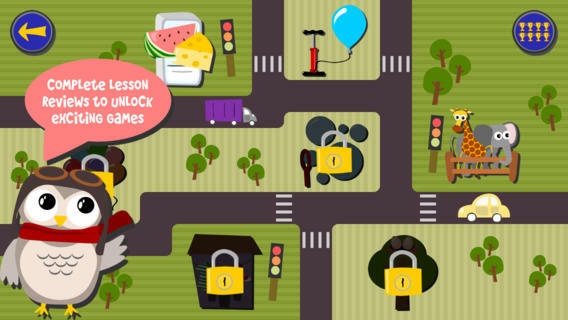 If you pass the quiz you will get to unlock the next level to start learning more objects. Once you have passed some quizzes you get to participate in games where you are a bird blowing bubbles trying to catch the correct word announced. The more you get right the higher you score will be. There are a ton of different games that will keep you learning including poping balloons with the correct object that is being announced. Your goal is to try and get the gold trophy! Gus on the Go is also available in 22 other languages with many more on the way and is currently priced at just $3.99. This really is a great app that your kids will love to use on the iPad and iPhone.